I’ve been meaning to blog this for far too long. I love this outfit that I put together from Collabor88’s current collection. I think that everyone really pulled out all the stops this round and I’m so excited to see what comes next.. and for the Arcade that starts very very soon! The skirt and top are from Emery, the hair is from d!va, the skin is from Glam Affair, the eyeliner is from Nox, the jewelry is from Yummy and the shoes are from Pure Poison. Everything can be found at Collabor88 until September 7th. When I saw this Cape at Collabor88 from Milk Motion – I knew that I wanted to do a “Red Riding Hood” inspired look. This cap is also from Milk Motion and I like the little veil that comes with it. This hair – also at Collabor88, from D!va – I think also goes perfect with it. The Mesh shirt and Leather Mesh Skirt separates are from Tres Blah – and you guessed it! Also at Collabor88. The poses (not from Collabor88) are from !bang and these boots are from H.O.F. from the Arcade. My skin is Candy from Glam Affair – at the Arcade and the Glasses are from Burley. My tights are from Izzies. Really, really loving this round at Collabor88. I found a lot of cute things to put this post together that can be gotten from there. The hair is from D!va, the skin is from Glam Affair in Lulu, and the necklace is from Noodles. I just saw these three things and they just seemed to go so well together. The outfit that I’m wearing in this post is from Tee*fy and its perfectly feminine, light and airy! I love it! 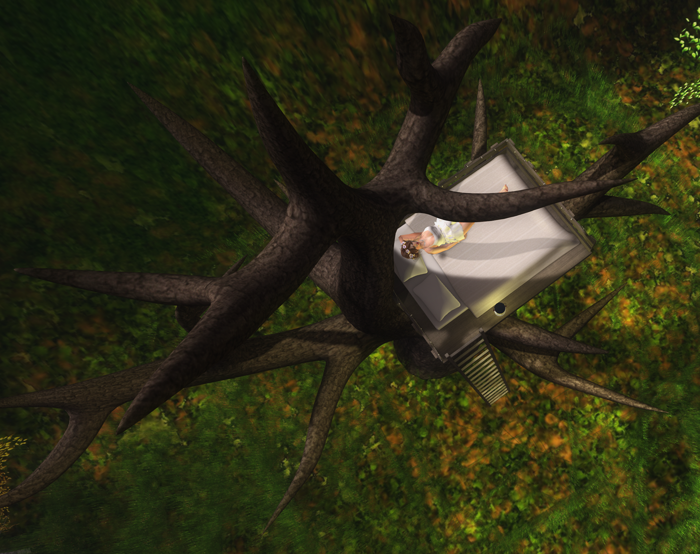 This tree bed is from Fri.day which is also at Collabor88 and it is one of my favorite furniture items right now. The sit poses in it are really cute and I tried to show them well in a few photos. Get your butts over to Collabor88 and see the new pretties! Good Morning Second Life and happy Friday! I am first wanted to show this very cute pose from a store called .click that specializes in Second Life Family Poses, in this photo is my adorable daughter Imani “Turnip” Isabella Olivier. She says hello! The poses at .click are some of the cutest that I’ve seen for families. Onward and upward there are many awesome new things being offered at Collabor88. This gazebo/daybed set from floorplan is one of my favorites this round. I love the bed that comes with it and the colors in general. The prim count is not too shabby either. This skin is from Glam Affair, also at collabor88 they have released a Europa tone for Margot and I think the make-up on this one in particular is beautiful. This fanciful wistful hair comes to us from D!va and I also used a pose from Marukin.. all available at Collabor88. My flip flops are from Gos Boutique. Happy Saturday! I had the pleasure of checking out a new skin that debuted yesterday at the 2013 Skin Fair by Mochi Milena of Pink Fuel and I love this face, it is so sweet looking and fresh and youthful. Pink Fuel is known for adorable skins and this one is one of my new favorites. Above I snapped a photo of the 8 options for eyes and below are only some of the options for lips, yes there are many! I can’t just pick one favorite either, one of the best parts about getting a new Pink Fuel Skin is all of the lipstick options, there are so many to choose from and they are gorgeous. There is also many brow options with this skin, all of the standard hair colors and an option to wear no brows if you want. I really do think this skin is gorgeous and the fat pack is at a very special price which I don’t know how long that is going to be for so you are going to want to get over to the Skin Fair right away because you only have until the 31st! The hair that I am wearing is from this months round of Collabor88 from D!va and its oh so cute. I went and checked out the new Spring look to the Izzies Mainstore sim and found it to be just gorgeous. I suggest stopping by to see it, that is where I took these two pictures for my post. I have a few things to remind you about. First is that you should not forget to pick up this gorgeous hair at Collabor88 this round. I love the flowers and the braid and the updo is so cute. It’s from D!va who is a monthly contributor to Collabor88 and I just love her hair. Now, this dress that is at the Pisces round of Zodiac right now and its from Evie’s closet and I’m in love. I love anything to do with the sea and this dress was made in a beautiful way with the shells that cup the breasts and the floofy skirt. I can imagine being a mermaid bride in this. The poses that I am using are also available at Zodiac from !bang. The dresses this round of Zodiac are brilliant. My skin is from Glam Affair as a collaboration with Dead Apples (where my eyes are from in this post) it’s the Amberly Petal skin in Teary. My feet are from Gos Boutique! There are many beautiful things at Collabor88 this round, and whether you are looking new clothing, shoes, hair, jewelry, sky boxes, or etc they seriously have it covered. You will go in there and buy many things if you have not already! The furnishing for my room are form a mix of Cheeky Pea, Pilot and Lisp. I had to cut the pic down to size but there is a full version of it on my flickr but with the stuff at Collabor88 this month you could easily furnish a very cool room. Everything that I am wearing except for the new skin and nails from Izzie’s is from this round of Collabor88. The shirt comes from the Sea Hole. The pants are from Auxiliary, The hair is from D!va, the shoes are from Ingenue, the rings are from Yummy and the Necklace is from Maxi Gossamer.